But at lunch time I went to get something out of the freezer and noticed that the ice cream on the top shelf was now dripping down onto the shelf below and onto the floor as I took the box out. Turns out the whole refrigerator was dying. Thankfully it waited to die completely until after the hubby got home from work, but he had to go out and buy a new refrigerator. We got a decent deal. It's smaller than my side by side that I had, but we do have a chest freezer now so the small freezer isn't such a big deal. It did force us to do a bit of spring cleaning in the refrigerator I guess, but this is just not the way that I had planned to spend my evening! So yeah, it's pretty much been one of those days that if it could go wrong it did, and I was ready to go back to bed by about 8 am, when my work day starts at 7! Thinking it's a good day to head off to bed early! Beautiful flowers out our backdoor. The red building is our neighbor's workshop in his backyard. He is a very talented wood worker! The neighbor' workshop and the flowers again. I loved the lighting on these that day. The same neighbor's front porch. He is quite a decorator! The bald eagle's nest from the famous eagle cam check them out we've been watching since they were first laid as little eggs. They have been mentioned on many news channels including CNN and people from all over the world are watching them. They are about 20 minutes away from me. If you look carefully/enlarge this picture you can see one of the parent eagles heads. This little owl crashed into my front window. Flew right into it, we don't know if something was chasing him or if he just didn't see it. It was around noon or one in the afternoon. He sat on my porch for about 45 minutes collecting himself and let me open the front door just a bit to stick the camera out and get some pictures. This picture is to show his size. We found later that he was a full size adult. 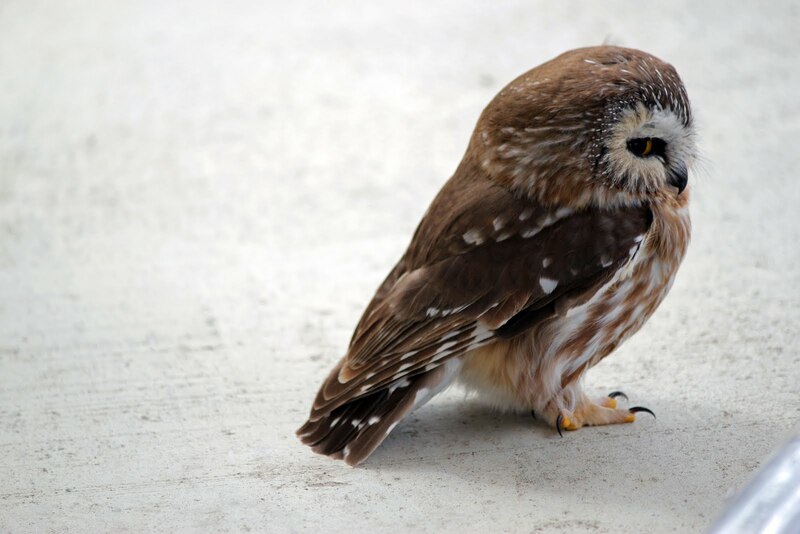 He is a saw whet owl. After sitting there for the 45 minutes or so he pooped on the porch and flew away! I love the "wink" here! I won a facebook contest with Canvas People with one of his pictures. Yes, once again I have been a bad blogger, very bad blogger. I knew it had been a while since I had blogged but I didn't realize that it had been March when I last blogged! Lots of things have been changing around here. The most fun being that Little Miss now has a baby brother...Bubba...and he has been coming full time now and he really takes a lot more of my time and really, who can resist a chubby, snuggly, smiley baby?! Not me! And of course Little Miss has regressed a little bit needing a bit more of my time (including smacking me in the face this morning resulting in a time out for her!). Fun fun. I've been busy with pictures. I finished senior pictures and a graduation slideshow. I am working on pictures for a website, editing pictures for a baby dedication and two sets of family pictures that I took on Easter as well as our fun "family" pictures on Easter. The Awana year is over, two of our BIG projects came right at the end of the year and RIGHT before Easter causing me lots of stress. Hubby is in charge of our Awana Grand Prix, the kids get a block of wood, similar to the Boy Scouts Pinewood Derby cars, and they build their cars with their family, have time trials and weights and measuring on the Wednesday night before the race during game time, and then on Saturday (the Saturday before Easter fun fun) we have the big race in the morning from 9 - 12. Lots of time spent decorating and getting helpers sorted, races lined up, hubby had two actual race cars parked out front, and then of course you have clean up afterwards. Our Pastor had a reporter come from our local paper and our Awana Iowa missionary came to be our speaker and help to present the race awards. It was a lot of fun but a lot of stress and work around our house. And you know I was there taking pictures! And then there was our closing program where I have taken all the pictures I have gotten throughout the year and put them into a slideshow with music for a video to show the parents/families what the kids have done through the year. We try to make sure that everyone shows up in the video at least once. With 70 some kids, some who I don't know or recognize by name especially in Sparks, that gets a little interesting! I am still teaching Sunday School, although this too brings some change. Sunday will be my last week teaching the Jr. High class. I have been the "lead teacher" and helping to prepare a new teacher to teach on his own. It has worked well as I have had to "sneak out" of class a few times for different reasons. But now our 1 - 3 grade teacher has requested a break so I will be sitting in on one last class for our new teacher in the Jr. High class and the next week I will begin teaching the 1 - 3 grades with the start of the new quarter. I am looking forward to it, although I do have to admit being a bit sad and thinking about how I will miss teaching the Jr. High kids! Vacation Bible School is coming up in July and the sign up sheet for teachers and other help has gone up on the bulletin board. One teacher had signed up, for the fourth grade class so I wanted to decide which class I wanted quickly so I could have my choice. I went and signed up tonight when I was doing a couple other errands and I chose the 2nd grade. I'm excited! It will give me a chance to get to know some of my class a little better, and be a different age group than I have had the last few years in Sunday School and VBS. The last two years I have taught 5th grade and then 6th grade. I figure I might as well embrace the change, right?! The high school baseball season officially starts tomorrow and I will be going to as many games as possible to get some pictures for some friends' son's pictures, he will be a senior next year. And I need to be working on senior pictures for him as well as pictures to send to his aunt for his graduation scrapbook. Never a dull moment. I'll be slowly starting to take some of his senior pictures over the summer and school year too. Our schedules are both so busy with work and other activities it looks like we'll have quite a few "mini" photoshoots to get them all in. Anywhoooooo that's what's going on around here. I am going to try my best to write more often and I am thankful for those of you who have kept in touch with me and prodded me to blog and post pictures while I've been away. Rebecca Jo I'm praying for you and your family! And Brandi you have the most adorable family! Great to see pictures of them and the projects you've been up to! I'll post some more pics soon! I finally finished typing the files in the main folder that I was given and was able to return that back to it's owner! SO glad to have that done! Now I have another small envelope (with 9 files) and then a couple short ones in another folder. I should be able to get it done pretty quickly! I got pictures from Amanda to scan and put in a video for her graduation too. She has to get me a list of music yet, but this way I can get a start! I should have more time to get these projects done now that basketball season is over. It's Dr. Seuss' birthday! I'm looking for some crafty/coloring things for the kids to do now. PBS has a marathon of The Cat in the Hat Knows alot about That today. The emergency altert system just came on with a monthly test and the kids panicked...Bug looked at me and said I don't know what happened...where's the movie...what happened. I think he was afraid that he was going to be in trouble haha! Wow, PBS just did another test...both Bug and Little Miss looked at me and asked what happened in chorus! Well, I'd better keep moving and get some things printed off for the kids. Hope you all have a great day! Wow! I have to much to tell you! It was definately a crazy and busy weekend! Thursday our boys basketball team was playing in a town about an hour and fifteen minutes away to advance to the next level for the state tournament. Our plan was as soon as Little Miss left we were going to pick up the three boys Dad and head for the game. He called later and asked if we had room for another friend...we did and I believe the plan was for us to pick him up at his office which is on the way. Well, he went to pick the boys up from the after school program and they couldn't find Bug. He called to say he was running late, we all thought he was in the bathroom or being a stinker and hiding. So we waited a bit, I cleaned up a little more around the house and we soon headed out to their house. Their Dad pulled up to the house ran out of the car to the house and I saw the boys start to open the door and head out too. K and I were talking and not paying much attention when their Dad came up to the car and said that Bug was still missing! Panic! He left the oldest at home in case someone called and he took off in one direction, we went another, and a man who lives next door to the school and heard what was going on went in a different direction. We came back by the house to see if he had made his way here somehow and not seeing him we headed for PM and C's house (Bug's Grandparents). No Bug. We started driving sidestreets and alleys around their house looking for a little head bobbing down the sidewalk (the snowbanks are so high it is hard to see some of the kiddos even if you are in a car) and thought we had found him for a second only to find that it was someone else. We joke that we tried to add kidnapping charges trying to grab some innocent little guy! Can't tell you how hard we were praying that we would find him, and quickly! We looked for a half hour to 45 minutes and I FINALLY got the phone call that he had been found. The little stink pot had gotten bored or something at the after school program and put on his boots, hat, mittens, coat, and backpack and decided to walk to his other Grandparents' house!!!!! We don't know which route he took but it's at least 1.1 miles for him to walk! K drove a couple routes after we got back to town from the game and dropped everyone off! What bugs me is that when we had gotten the call he had just arrived at the Grandparents' house. And like I said it is a little over a mile that he had to walk....so how long was he missing and no one noticed. How did they not notice that he was gone while his two older brothers were still there?? I am SO thankful that when we walk to the park a couple blocks away I stress that we have to stop at corners and look both ways not once but twice so I know he knows that! He's never had to walk like that before so we really have no idea what made him decide to do it that day! I am MOST THANKFUL that we found him and that he was fine! He was a very tired little boy though, and was asleep before his Mommy got home from work that night! We finally met the boys' Dad and the other friend at the boys' house and headed for the game. The oldest came along with us too. He was so sweet, when we were talking about it a bit he said "Dad, when you were out looking, I got down on my knees and prayed!" Brought tears to my eyes! Wednesday night we had two clubbers receive Christ as their Savior! One of the boys had been talking about it on his ride home with a friend to a neighboring town and the friend's Mom asked if he wanted her to pray with him. He said no, he wanted to pray with his Awana leader! That leader is PM and C's son. I was SO excited and happy for him as well. I had just been telling C the week before how impressed and proud I was with him as he had given up his men's league basketball with his oldest brother to be an Awana leader. And basketball is one of his favorite sports, and to play with the men was a big thing for him! This guy also says that he wants to be a missionary and has gone to Brazil twice now! He is like a little brother to me (even though he is quite a bit taller than me lol) and I can't help but "brag" about him! I can't wait to see how the Lord continues to use him! Then this morning, I go to check my facebook and find that another little guy, the younger brother of Amanda, who I took senior pictures for, accepted Christ as his Savior this morning! On Amanda's 18th birthday too! Wow! Friday I didn't have any kiddos so I worked on my file typing for most of the day. When K came home from work we headed to the church and worked with PM on a mudding and painting project in the main hallway of the church. It went alot faster than we thought it would and instead of breaking the painting up into two days like we planned we kept at it and finished up around midnight or 12:30 Saturday morning. We had some clean up left to do on Saturday but nothing like we thought we would have! The only problem was one of the tarps we used had a hole and as careful as we thought we had been and cleaning up the spots we found on the carpet as we went along we found a big spot that had dried Saturday afternoon while picking up the tarps. Most of it came up, but it's still somewhat noticable. They do want to get new carpet to match the rest of the entryway in there though, so I guess it's not terrible. It was actually alot of fun, and alot of work, and we definately have some memories after that lol. Lots of things get quite a bit funnier when it's that late and you are that tired! Soo....yesterday honestly I was dragging a bit and had Bug mostly ready to go to school when the bus came early and she didn't wait long. When I had gotten Bug all set and got to the door we saw the back of the bus going down the road! UGH! So I called his Mom, hated to wake her up, she was sleeping after working the night shift, but she came to get him and took him to school. Hopefully today is a nice quiet day the rest of the day and I can get some more typing done! Four more things to type and I can get this file folder back to be put in the files again! Despite a terrible headache afterwards it was a great night at Awana last night! It was friend night for double friend points and we had lots of friends out. We had two clubbers accept Christ as their Savior last night too! I was so excited, our best friends' son C was the one to lead them to the Lord! He is a junior in high school and has given up his men's league basketball nights to come and be a leader for Awana! I love that kid and I'm so proud of him! No church on Sunday means that I have all my typing and Sunday School preparation done. I've been doing some typing for some files now...I'm really feeling off this week without my typing and things to do! It does sound like we plan to get together to go over the PowerPoint again just to make sure we're all on the same page before Sunday. Kiddos are pretty quiet today, they've watched some tv and now they're coloring on the big dry erase board. Love that thing, it's been good entertainment quite a few times now! The headache I had last night is finally gone, but I just feel so tired and out of it today. Naptime for the Little Miss can't come soon enough! Tonight is going to be another late night too! Don't know much more than that for now...I'll have more pictures to share once I get them downloaded to the computer! Hope you all are having a better day than I am! Back to work today! Sounds like it will be a busy day too! Mr. Bug is here for the morning and will get on the bus for school just after lunch, Little Miss is here all day, and it sounds like I'll get four more girls for the afternoon. Hopefully everyone gets along! At least the day will pass quickly! Now that I've finally gotten some other things caught up with my weekend off I can focus more on pictures! I have quite a few I want to post here to share with you all, basketball pictures for Facebook, some of my brother's wedding reception to post on Facebook, and Veteran's Banquet pictures to burn to cds. Also it sounds like I am going to make a graduation slideshow for Amanda whose senior pictures I was taking so I will have lots of pictures to scan and put into a video. Never a dull moment ha! Guess that's about all I've got for now....maybe I'll be back later this afternoon...hope you all have a great day! I am 35 and have no kids of my own, I just borrow other peoples as I do home daycare lol! I have two dogs, a shih tzu and a miniature poodle who are both very spoiled! This is a Flickr badge showing public photos and videos from H3IdI. Make your own badge here.